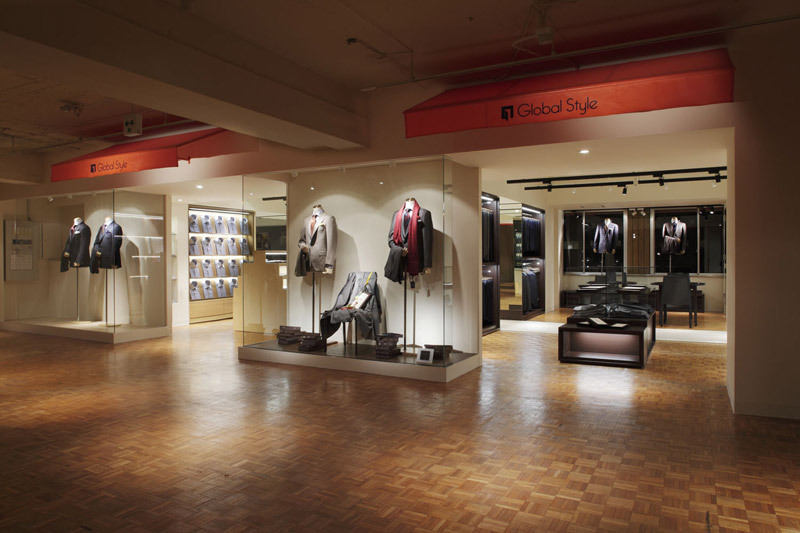 A new brand shop focusing on tailor-made suits is being proposed for the 2nd floor of an office district in Osaka Honmachi. 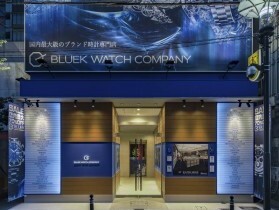 Osaka Honmachi is the center of the thriving finance business and textile industry. 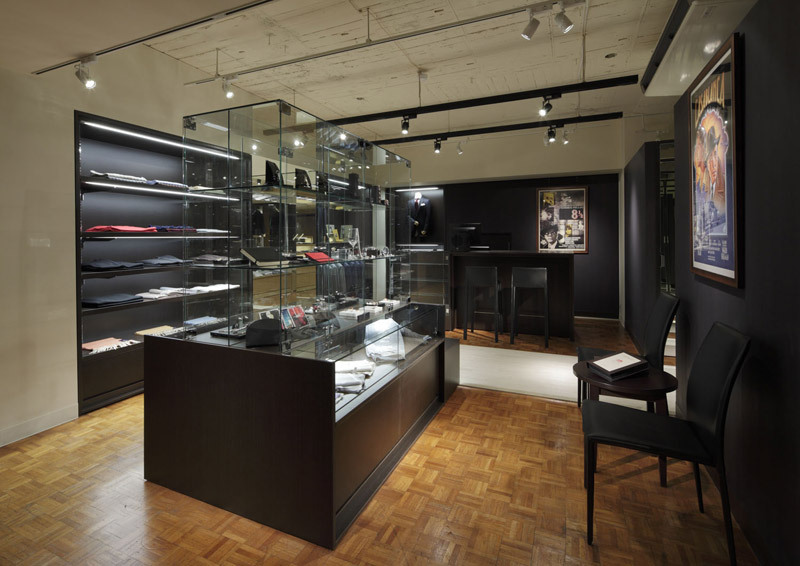 That being the case, there is a wide variety of business fashion styles ranging from people who wear classical suits to people who wear casual pants with jackets. 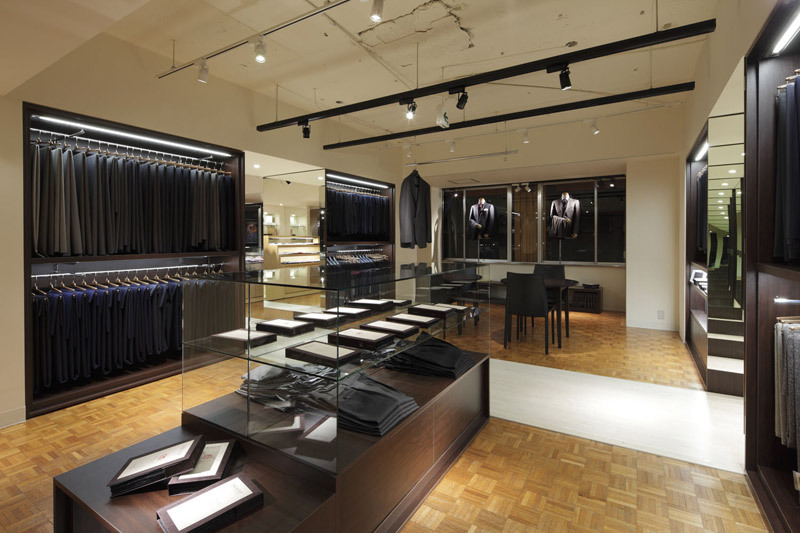 Thus, it was clear that customers cannot be attracted if the store were to be stiff and formal like a traditional tailor-made suit shop where it is difficult for one to set foot in. 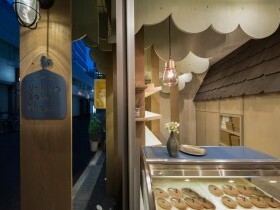 Therefore, in order for the customers to not be easily noticed by store clerks from the moment they set foot in the store, we divided the one big space into 3 smaller ones, with each space not directly visible from the adjacent space. 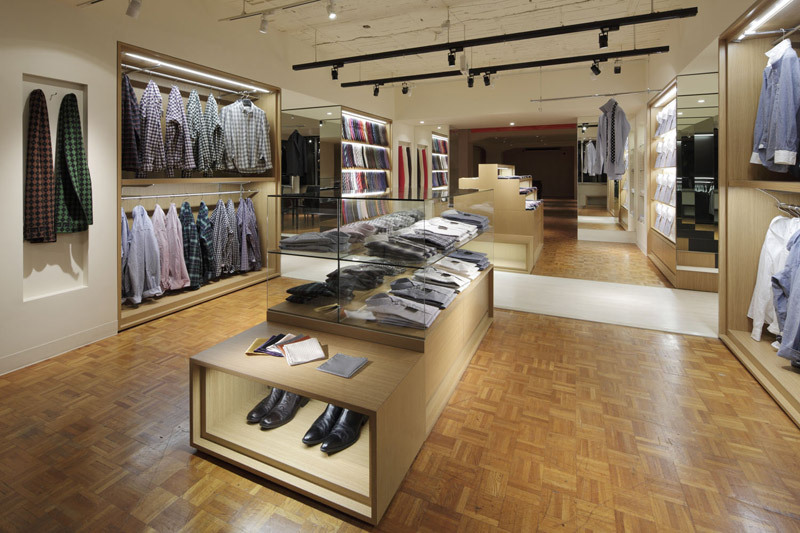 By hindering the store clerk from talking to the customer immediately, customers can enjoy a casual look-around. 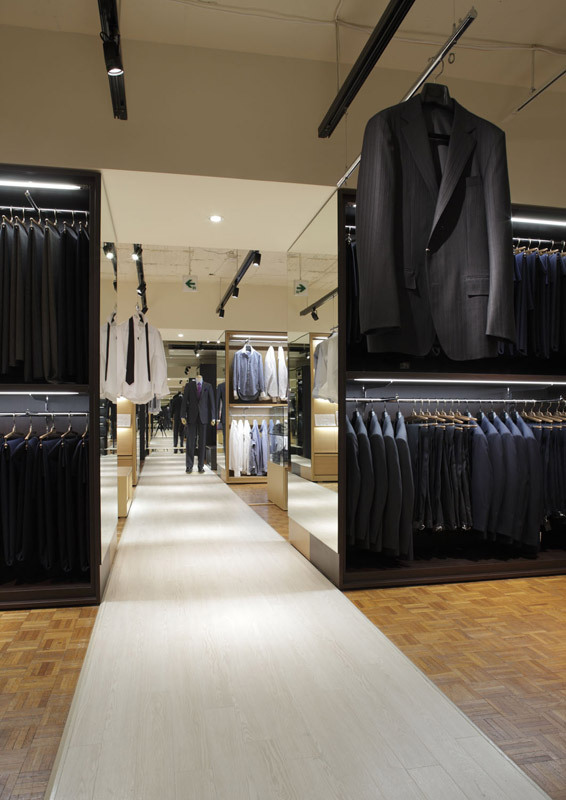 The target is for the customers to perceive this as a shop that they can step in freely and without obligation, thereby making the tailor-made suit shop easier to step into. 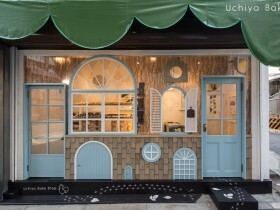 Next, we proposed to connect the 3 small spaces with one long stage, so that as the customers go around the shop, they would step onto the stage. As the customers try on different fashions as fashion models and step onto the stage, they can enjoy the original, tailor-made fashion style. 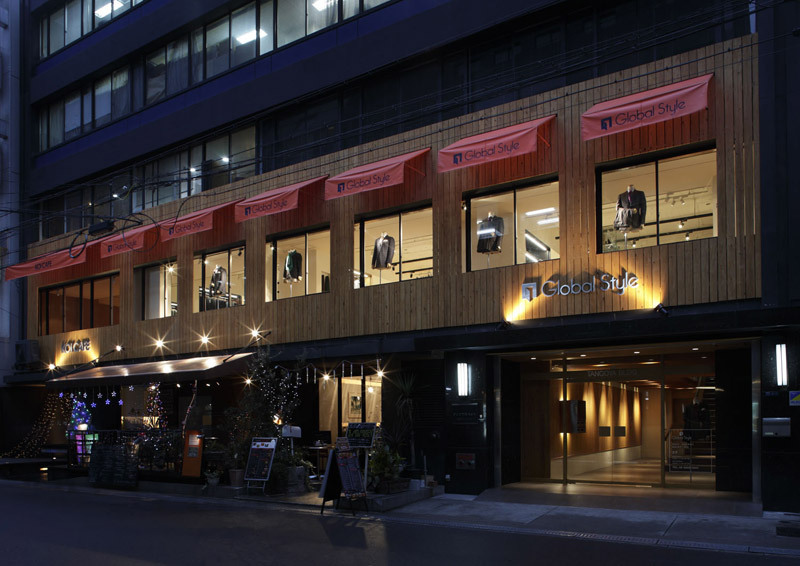 By having the customers perceive this shop as a place where they can create their own fashion style as a central figure, the aim is to dispel the traditional and outdated image of tailor-made suits. The wall fixtures are composed entirely of skeleton-infill, so that shelf boards, hanger pipes, shirt shelves and drawers are all replaceable. 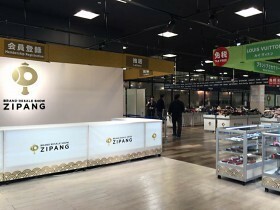 The staff can freely change the displays according to the needs of the customers and the season, so that even repeat customers can enjoy the fresh display each time. 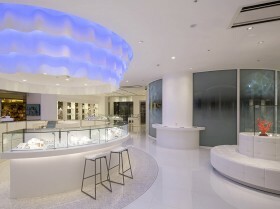 The objective is to make the customers feel that each time they step into the shop, they can experience something different to before, thereby creating a shop that customers never get tired of. 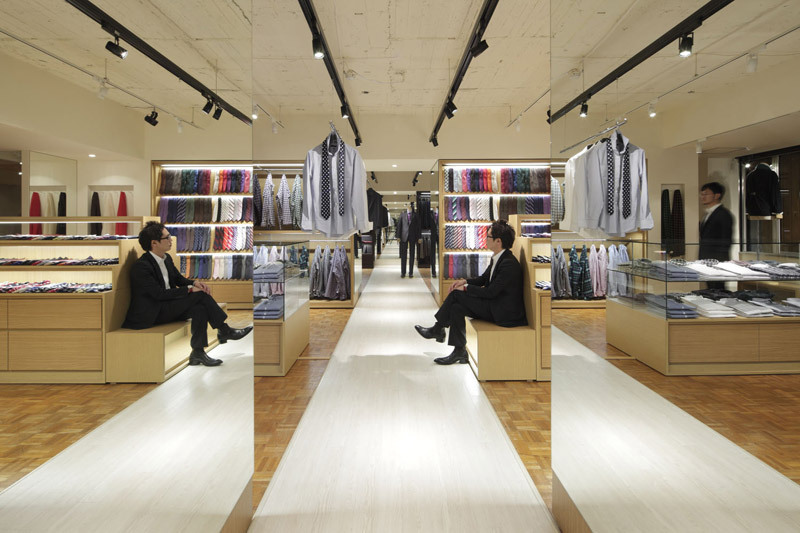 By means of the 3 small spaces, 1 long stage and thorough skeleton-infill, we created a tailor-made suit shop where the customers and staff together create a casual, enjoyable and free fashion style with the customers as the central figure.